Both acclaimed war miniseries are being bundled with an all-new documentary just in time for the holiday season. In an early announcement to retailers, HBO has slated ' Band of Brothers / The Pacific: Special Edition Gift Set' for Blu-ray on November 8. 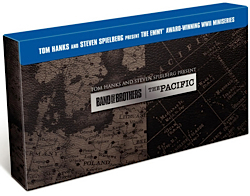 From executive producers Tom Hanks, Steven Spielberg, and Gary Goetzman, the two critically acclaimed 10-part HBO Miniseries 'Band of Brothers' and 'The Pacific' Blu-ray gift set with special documentary “Called to Service” featuring never-before-seen interviews from the Easy Company and 1st Marine Division veterans. Suggested list price for the 13-disc Blu-ray set is $199.99. You can find the latest specs for 'Band of Brothers / The Pacific: Special Edition Gift Set' linked from our Blu-ray Release Schedule, where it's now indexed under November 8.